NEW YORK, NY--(Marketwired - Jun 5, 2013) - Newlyweds Anne and Mike Howard left the United States in January 2012 on a 500-day honeymoon in search of the world's most romantic places and unforgettable adventures... but an around-the-world honeymoon wouldn't be complete without Europe. The epic journey has officially been extended to 650 days to experience Iceland, Ireland, Scotland, England, Norway, Netherlands, France, and more of the continent's most coveted locales. Sponsored by destination wedding and honeymoon expert, Honeymoons.com, Anne and Mike post their travel tips and tales on Honeymoons.com as well as their own website, HoneyTrek.com. Between Honeymoons.com's 17 years of expertise, Anne's background as an ELLE DECOR editor and writer, and Mike's experience as a social media strategist and travel photographer, the blog is highly professional yet a candid and compelling tale of a couple's new life together. The Howards' itinerary has taken them through 215 places in 25 countries across South America, Africa, Asia, and Oceania from big cities to remote tribal villages to private islands. 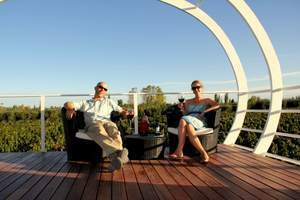 Not looking for the typical honeymoon vacation, they travel to wherever inspires them and seek out accommodations that exemplify the spirit of each place -- be it a live-aboard in the Great Barrier Reef or a vineyard cottage in Mendoza wine country. Their exceptional coverage of their accommodations and the story of their unprecedented 500-day honeymoon has been so well received that it has caught the attention of publications such as Condé Nast Traveler and tens of thousands of couples looking for tested-and-approved honeymoon destinations. "From the moment we met Anne and Mike we knew that they would offer brides and grooms-to-be a unique, first-hand view of some of the most romantic and exotic honeymoon options around the world," says Susan Wagner, founder of Honeymoons.com. "What a great view of the wide world of honeymoon choices for couples seeking out the utmost in romance and the ideal 'ultimate escape' for them." 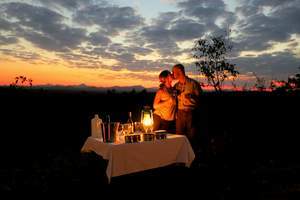 The Howards have experienced and reviewed over 50 luxury hotels, eco-lodges, safari camps, and outdoor excursions across five continents and are thrilled to see what exciting places Europe has in store for them and their honeymoon audience. Next stops: Irish inns, English castles, Nordic ice huts, Parisian pied-á-terres, and accommodations that only the illustrious Europe could provide. At each locale, they will review their once-in-a-lifetime experiences and post insider travel tips across social media platforms to help guide future honeymooners through their planning process. Other couples that may not have as much time will still get plenty of ideas on the world's hottest travel spots as they follow the Howards from Asia to Europe. The intrepid duo is currently celebrating the 500th day of their honeymoon in the Philippines and will island hop through Indonesia then onto Hawaii before arriving to Europe in late summer. With a plan to start in the cooler countries of Iceland and Norway and finish in the more temperate Netherlands and France for fall, they have timed their trip for the ideal seasons to experience each country's wonders. "You would think 500 days would be long enough for a honeymoon but with each day exploring this amazing world, our love only grows stronger," says Mike. "Europe has so much to offer newlyweds and we can't wait to discover its iconic destinations and hidden treasures." About Honeymoons.com - Since 1996, the goal at Honeymoons.com has been to cover the world and provide in-depth travel and resort information to prospective brides and grooms. The site's vast resources help them find, research and book destinations and accommodations that will be ideal for the two of them. Whether it's a destination wedding, a custom itinerary, a honeymoon package or an all-inclusive honeymoon resort, Honeymoons.com helps newlywed couples book the dream vacation getaway. Newlyweds Anne and Mike Howard on their around-the-world honeymoon. Anne and Mike's travels have already taken them through 215 places in 25 countries, and they are about to embark on the European leg of their 650-day journey.